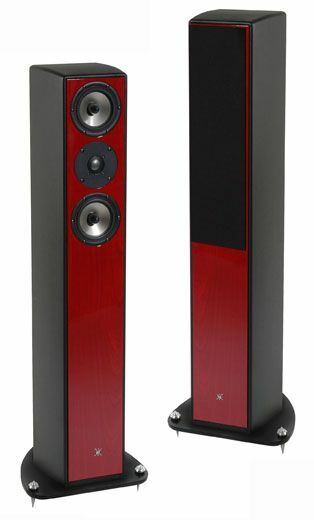 The Debut is a floor speaker with a 3 ways floor ported bass reflex design. Created entirely from the Research and Development of Synthesis using sophisticated CAD programs and extensive listening and fine tuning, the Debut trace's the same principles that characterise our other models. In order to increase the rigidity of the design, the panels are glued in such a way so as to eliminate standing sound waves within the inner cabinet. Such attention to detail allows us to obtain a further increase in the rigidity of the panel and so an even smaller overall resonance factor. The drivers used are a custom manufactured 110 millimetre aluminium mid/woofer and a 25 millimetre aluminium dome tweeter. These drivers are made specifically for the Debut. Thanks to this design we are able to obtain extended frequencies down to 50 Hz and we are also able to delineate the high frequency range up to 20 kHz. More over the tweeter possesses the ability to reproduce a rich, precise and incredibly natural sound. With an efficiency of 87 dB and a power handling of 120 watts rms, the Debut is at home on most amplifiers. Power handling: 15-120W unclipped prg.